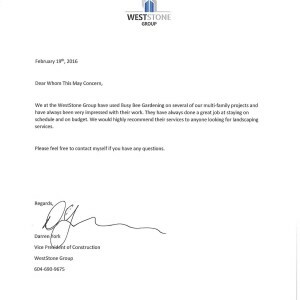 I write to you on behalf of Strata Corporation BCS 3348 – “Edgemont” – 2982 Burlington Drive, Coquitlam, in regards to the recent window cleaning job provided by Busy Bee. I would like to send my appreciation over to you and your crew who were able to look after the entire window cleaning project without any Owner complaints, without any delays on the work schedule, and without any reports of missed windows. This job provided by Busy Bee was noted being excellent by the building manager and several others! I look forward to continue working with you again in the future. Have a good day. 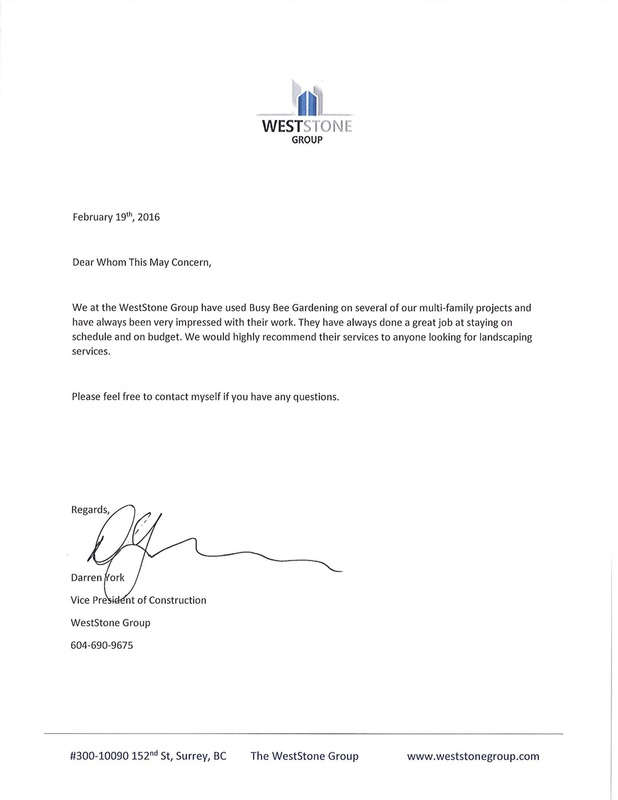 I would like to recommend David and his crew for the work they have been doing at our apartment building. Over the last four years management of our apartment building have let the landscaping deteriorate terribly. Without even being told I could tell there was a new company maintaining the grounds because things got done and it began to have a loved look. Last year the crew pruned the trees to make it safer. I asked them to clean up the litter on the sidewalk too and they did. Locals don’t litter as much now. I find these guys positive and helpful. A well maintained and attractive yard is a gift to the people that live on the property but also to the people that life on the street. Thanks guys. I have had the pleasure of working with Busybee for over 18 years at properties I have worked at or lived in. Gardening and irrigation services are wonderful; the window washing and gutter cleaning, excellent; staff are courteous and friendly. With the extra services provided, it saves money and there is only one supplier to deal with. If concerns arise they are discussed and resolved quickly. David is always ready to visit on site and offer his advice and wisdom. I highly recommend Busybee for all their services. I wanted to drop you a note to let you know how pleased I am with the landscaping work you and your team recently completed. We were very impressed with your team’s great attitude and the professional level of service we received from the very beginning of the job. We will be sure to contact you again with our future landscaping projects. 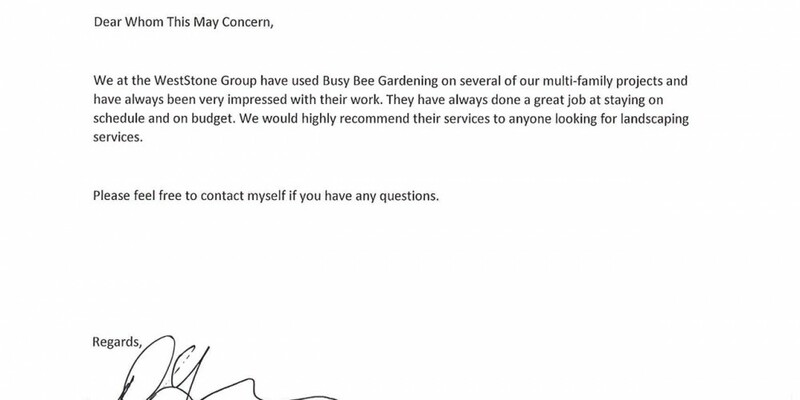 Busy Bee Gardening were given the contract for the Sandlewood Property over 1 year ago. We as Council saw first hand the amazing job they were doing at the property next to us, Terramore. Given the large size of our property and the 200 units we have, attention to detail, security, privacy, and beautification are very important needs. David Hills, owner and operator of Busy Bee, has met and surpassed our expectations as council and owners. David takes a hands on approach and personally meets with us onsite to address any concerns. Our property has never looked better and we could not be happier. I would recommend Busy Bee as a service provider for gardening needs. I am very happy to work with Dave on any size of project. Procedures and recommendations are well explained and any deficiencies taken care of immediately and professionally. My name is Erika Castellanos, owner of unit 96. I writing this email to express my complete satisfaction with BusyBee gardening, it’s has been a pleasure walking our neighbourhood, and enjoying this golden daffodils everywhere. They have done an excellent job, so I just want to let you know how happy we’re with their service. They did such a good job last year that I got motivated to plant my own tulips, so we did it with my daughters, and we’re still waiting to see the results. Once again, thanks to the gardening company, and thanks to all of you for your hard work. 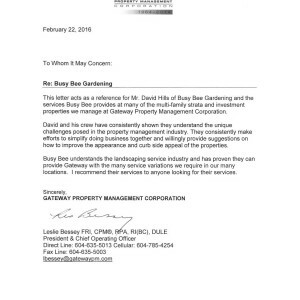 I write this note to let Busybee Gardening current and prospective customers know that the services provided by David Hills and his team are second to none. At Glenmore, a 223 unit strata development in South Surrey we have been using Busybee Landscaping services for the better part of four years now. Recently we made a decision based on our experience with Busybee to broaden the scope of services offered by David. We now use Busybee for Janitorial/Handyman services, Gutter Cleaning, Window Cleaning, Minor Electrical Services and Fountain Maintenance. This has worked out very well as we have fewer service companies to deal with streamlining our operation. I strongly recommend that any strata focused on simplifying operations look seriously at what Busybee has to offer. David and his team are true professionals and a pleasure to partner with. I have been using the all inclusive maintenance plan offered by Busybee Gardening and personally I am perfectly happy with it. From the logistic point of view, the plan required less telephone and email work at my end (you only deal with one contractor, not with five or even six). Financially, the plan ended up being less expensive than all those services would have been if taken separately. Everything is easier, faster and less expensive. Great idea, good results! I am the Council representative in charge of landscaping for the Monta Rosa Complex in Surrey. 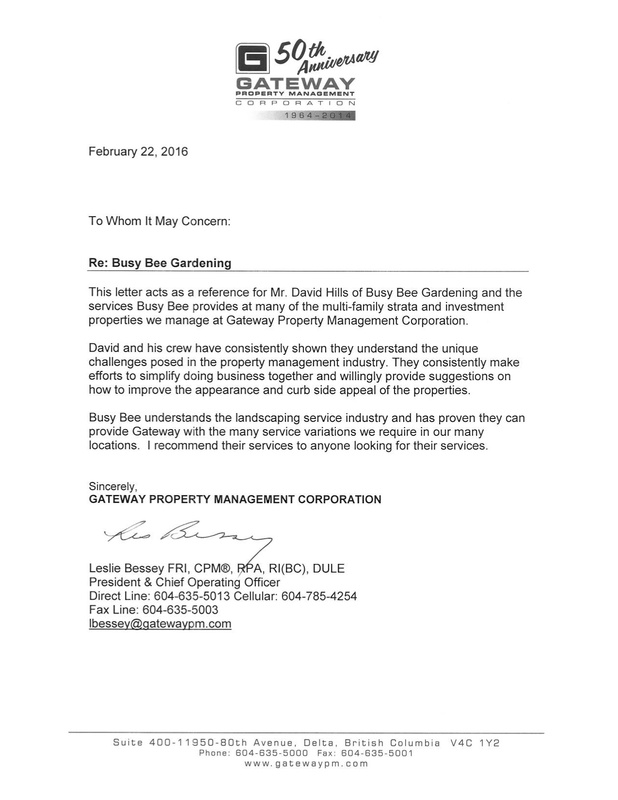 The complex is into their second year with Busybee Landscaping and would recommend this company for any of your Strata needs. The crew are very friendly and efficient and communicate with me on a weekly basis. I am able to email specific requirements that are needed and almost on all occasions those are dealt with in a very timely manner. I am kept up to date by Fernando ( the crew chief ) with what is happening and when major projects will take place (eg. Major pruning, overseeding etc.). Since we employed this company – Council has had nothing but positive feedback from the 48 units in the complex. Even our neighboring complexes have complimented us on our much improved strata grounds. Again, I would recommend this company. We are a very large property and have a tremendous amount of green space to maintain and this company accomplishes this task extremely well. I started working with Busy Bee Gardening a while ago. Their approach to tackle the landscaping issues is different than other landscaping companies. Their quoting is very competitive and their job performance is great. Also, they have a very good customer relations program. You can definitely rely on their services. Ian Osman – Property Manager, Croft Agencies Ltd.
David and his crew took over the landscaping in Wedgewood complex approximately 2 1/2 years ago. Our previous landscaper had been on site for around 20 years and had become quite complacent and had allowed the shrubs, bushes and trees to overgrow. When David started there was many years of neglect from lack of trimming and weeding. In the 2 1/2 short years that David and his crew have been on site they have made a huge change to the appearance of the complex. Most of the trees and shrubs have been trimmed and shaped . Evergreens that had been allowed to grow down to the ground have cut back 6 to 8ft. Not only did this enhance the appearance of the complex but it is much better for security reasons. David and his crew have always been very courteous and professional and would certainly recommend them. Busybee are currently doing the gardening for our complex at Champlain Village. We are completely saisfied with the service they provide. We have found them to be attentive to detail and respond immediately to questions and concerns that we may have.They are commited to pesticide free gardening practices and use organic materials. I have no hesitation in recommending their services.